Manufacturer of a wide range of products which include fusing / heat press machine controller. 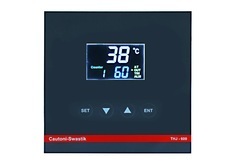 CAUTONI-SWASTIK Offers Customized Controller for Heat Press Machine ( Fusing Machine ) for Auto and Manual Machine. It includes all features on compact single board with different feature and Display. Arc Extinction Technology gives additional feature to drive.2000 W heater directly and make controller more powerful. Looking for Fusing Machine Controller ?